Bougatsa is a Greek pastry filled either with a semolina custard, cheese or minced meat. Bougatsa has its origins from the Byzantine period (before the fall of the city in 1453), when Constantinople was still Greek and was famous for its plakountes, which meant flat and when these were later taken by the Romans were called placentae. The word bougatsa is also connected with focaccia, as mentioned in Ottoman dictionaries but if you read about focaccia you will see that facaccia had its origins from the Ancient Greeks. 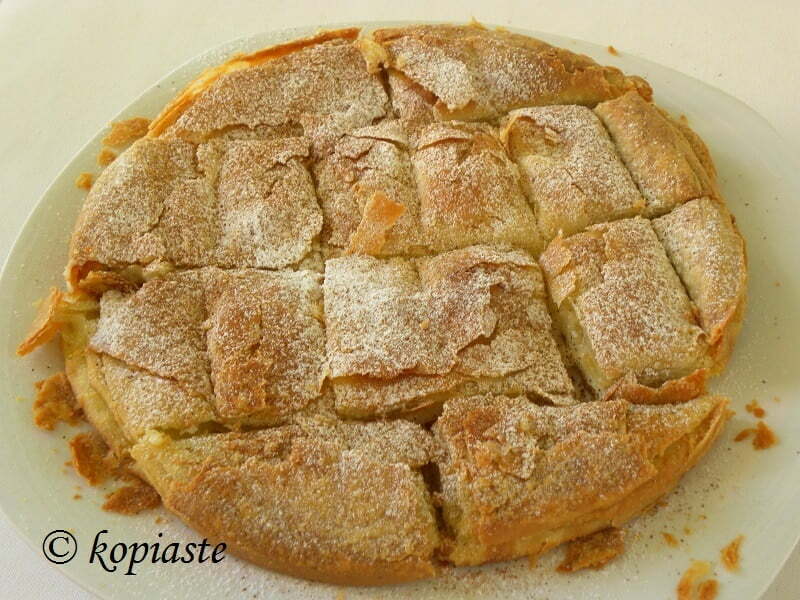 Bougatsa originally began as a dough which was stuffed with different fillings. Bougatsa dough then evolved into a hand made phyllo which was rolled out up to a certain extent and then it was tossed in the air and becomes very thin. It is then stretched further on the counter and is used to make pastries which are called bougatses and these can be either sweet or savory. It can be made with a sweet semolina cream or the savory ones with feta cheese, with minced meat, with spinach, with potato etc. Bougatses started being produced in Greece when Greek refugees from Turkey came here and a lot of them settled in Northern Greece. It became a speciality in the towns of Serres and Thessaloniki, in Northern Greece but because of their popularity, you can now find them all over Greece in shops called “Μπουγατσοπωλεία” (pr. Bougatsopolia) which sell only bougatses. Bougatses are also sold in small fast food shops selling all types of pastries such as tyropites (cheese pies), spanakopites (pl. for spanakopita), loukankopites (sausages pies), piroshkis, peinirli etc. This version of bougatsa calls for store bought phyllo dough, similar to the one used for baklavas or galatomboureko. Bougatsa has a filling similar to galaktomboureko and when baked, instead of adding syrup, it is sliced and served warm, sprinkled with icing s sugar and cinnamon. You may be wondering why I have been writing the word “phyllo” in Greek φύλλο, which means leaf or sheet, in this way. This is the correct way it should be written because as a rule Greek words with the letter “φ” (ef = f) when written in Latin or later in English, should be written with “ph” example pharmacy, phaenomenon, photography etc., also the letter “υ” (ypsilon = y) called by the Romans ” y Graecum” and by the French “y Greque”, should be written with Y and not with an “i” example, hygiene, hypothesis, hymne, etc., the letter “h” in front of the “y” which marked that it was accented with daseia, e.g. ὑμνῶ = hymn ( a mark or symbol which have unfortunately been abolished when the Greek language was simplified in 1976 but it is a symbol similar to the French accent grave, to indicate the vocal quality to be given to a particular letter). Heat the milk, together with sugar, citrus rind, vanilla and butter, until the butter melts. Add the semolina and start mixing with a balloon whisk. Add the eggs gradually, mixing continuously, until incorporated and continue mixing until the cream thickens. Cover the cream with cling film and set aside until the cream cools. Preheat the oven at 180ο C / 350o F.
Melt the butter and brush a 28 cm round baking tin (a bigger one would be preferable) or a rectangular 33 x 23 cm Pyrex. Brush each phyllo with butter and place it in the baking tin. When half of the phyllos have been added, add the cream which should reach 1 1/2 – 2 cm high, the most. Fold each phyllo that overlaps the pan over the custard, brushing it again with butter. Add the remaining sheets on top, folding the excess phyllo and brushing it again with butter. Trim the last sheet to the size of the baking tin and using a sharp knife score it without reaching the cream. Spray the top lightly with water. Bake for 40 – 45 minutes or until the top is golden brown. Making bougatsa with homemade phyllo is not an easy job but although I do not have the skills to toss the phyllo in the air, I have managed to make it with a very good result. The picture below is with homemade bougatsa phyllo which is based on my recipe for Shiamishi. I have made Bougatsa with homemade phyllo several times based on Shiamishi. Shiamishi (page 120 of my cookbook), and bougatsa have a few similarities as the phyllo is based on the same technique and the filling is also a semolina cream with a mastic flavour. After making Bougatsa many times with a wonderful result, I decided to make a vegan (“Nistisimi”) Bougatsa, making the cream with coconut milk and using olive oil and vegetable margarine. Roll out the dough, same way as for shiamishi. Cut a piece of cream and fold the phyllo. Repeat with a second sheet of phyllo. Place in a well oiled tin. I am linking this recipe to Ancutza, of Matrioska’s Adventure, for her event Ricette con la pasta fillo. j love greek and the food is very lovely.good photos very explicatives. I enjoyed reading your mpougatsa recipe. I have tried making mpougatsa a number of times, but it does not come close to what I get when I go back to Thessaloniki. Certainly the phyllo is one thing, though I found out that puff pastry is a good substitute. The cream filling is the issue. I have tried the filling as you outline it with semolina and eggs and it is “heavy”. Personally I do not think the mpougatsa made in Makedonia is made with eggs, primarily because the cream filling is white. I have tried making the cream with rice flour, but the texture is not right. As you understand I need help, since there is no mpougatsatsidiko around the corner, here in Northern Virginia. Do you know of any other cream fillings that may come closer to the “original”? Hi Dimitris. Are you sure the one with the white cream was sweet? I know that bougatsa cream is made with semolina and eggs. I would suggest you make a pastry cream instead but that has eggs as well. If you have eaten it in Thessaloniki with white cream, the only alternative I can suggest is making a simple pudding with corn flour (starch). May be it was mixed with anthotyros cheese. I’ve eaten bougatsa with white cream in Thessaloniki and Serres but it was savory and had feta as a filling. Ivy, the interesting explanation! I like this version with semolina and milk and a great idea. Congratulations! Ivy, a fantastic lot of recipes on bougatsa and, of course, a most enlightening explanation of its history. This isn wonderful stuff which gives the reader a better, a more profound understanding of where the recipe comes from and where, in the large scheme of gastronomy, sits their own kitchen. Their use and effect upon the pronunciation of words (daseia ῾ only those beginning with vowels but psili᾽also above an ρ at the beginning and when it is reduplicated elsewhere in the word) has been vigorously disputed, especially back in the 1930 most notably with people like Andreas Kalvos who gave lectures to the Brits on ancient Greek pronunciation. Incidentally, the daseia must have been pronounced similarly to the English/Latin letter H, h, since that is how the Romans transliterated it whenever they wanted to write a Greek name or word in Latin. We see it today in Helios ἡλιος and History, ἱστορία. These days it has become silent. These breathing marks and accents (of which there are three) have been abandoned by the Andreas Papandreou administration, back in 1982, and, to my mind, it was quite a progressive and brave thing to do. It use to consume many hours of unnecessary classroom time and strained the patience of the student -who had to also learn about long and short letters and syllables, which also took many hours of learning, hours which took away from the learning of other subjects. It also played havoc with printers of newspapers and books who had to have a hell of a lot more characters in their boxes to deal with, which consumed an enormous amount of time. Imagine every vowel, each without a breathing mark, then each with a daseia and then again, each with a psili! A hugve number of unnecessary letters to deal with! None of these little markings, of course -was it Kazantzakis who called them koutsoulies? (bird droppings)- affected the modern pronunciation of the words and are only useful for pedants like me or for people who are studying the ancient Greek language. They are of no consequence at all to the modern writer or reader. Please forgive me if I navigated too far from the point of this page, which excels in its purpose of delivering a lovely recipe for one of my favourite sweets! Geoge, thank you so much for your detailed explanations, which adds to my post. I never knew what daseia and psili were called in English. I think the breathing marks and accents were abolished before Papandreou, by Rallis. I know it was difficult to learn the language with all its rules but it was a lovely language which shouldn’t have to disappear. At least they could teach it as a special subject to those interested to learn it. Unfortunately the result today is uneducated graduates!! Glad you liked my contribution, Ivy. I never quite know when I’m overindulging my own whims! Apropos the accents, Rallis, coming straight after the junta, which had insisted on changing the education system of Greece completely so as to bring back the language of the ancients, Rallis, simply restored the Demotic language and reformed the education system generally so as to modernise it and to rid it of the juntaesque language and ideologies. No one but the churches and their authors spoke or wrote in kathareuousa (or the biblical Koini- κοινή as it was called) any more, and schools now began to ask students to pay more attention to the content, rather than the inordinate profusion and burden of grammar. Still, the use of accents remained pretty much intact, I believe, until 1982, when, after raging debates, they were finally discarded by the Papandreou govn’t. I can’t scan my own books so I’ve just done a search on google. I had already emigrated to Australia, by then so I can’t talk from personal experience of what went on in Greece. I had visited briefly in ’76 and it was still polytonic, complete with breathing marks. Kazantzakis, of course had already done the transformation, which coincided with his American contemporary poet, Ezra Pound who advocated similar simplifications to the English language… but that’s an entirely different story. I agree with you, the ancient Greek language is a brilliant tool of expression and you know that I’ve spent most of my life studying it with the deepest love but, in all honesty, Ivy, no language can survive the evolution of human intelligence and invention. It would be hopeless to try and include the whole, infinite world of new thought that has occurred since those days and the modern Greek is also a spectacular language. Plastic and resilient enough to be able to describe things in all sorts of degrees: trapezi, trapezaki, trapezara; agapi mou, agapoula mou; heri, heraki, heroukla, kosmos, kosmakis, etc. Very few languages can give a speaker or a writer such leeway. I love it! No Government wanted to introduce it, fearing a backlash from the conservative forces, until the pressure mounted by a number of newspapers and the University of Thessaloniki and it finally relented in ’82. Thank you George. Shall take a look into all the links you sent me.